1. 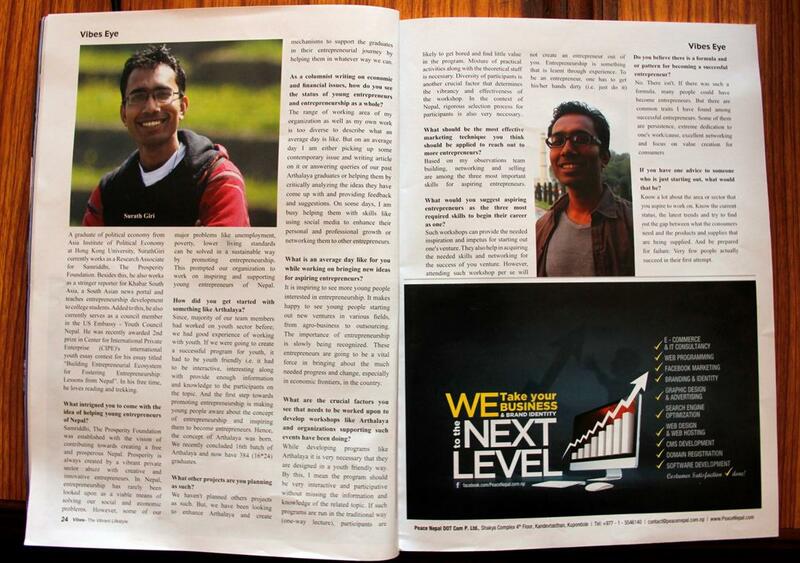 What intrigued you to come with the idea of helping young entrepreneurs of Nepal? Samriddhi, The Prosperity Foundation was established with the vision of contributing towards creating a free and prosperous Nepal. Prosperity is always created by a vibrant private sector abuzz with creative and innovative entrepreneurs. In Nepal, however, entrepreneurship has rarely been looked upon as a viable means of solving our social and economic problems. Majority of our young people think of seeking a lucrative job or going abroad after their studies but very few think of starting their own enterprises. However, some of our major problems like unemployment, poverty, lower living standards can be solved in a sustainable way by promoting entrepreneurship. This prompted our organization to work on inspiring and supporting young entrepreneurs of Nepal. 2. How did you get started with something like Arthalaya? Since, majority of our team members had worked on youth sector before, we had good experience of working with youth. If we were going to create a successful program for youth, it had to be youth friendly i.e. it had to be interactive, interesting along with provide enough information and knowledge to the participants on the topic. And the first step towards promoting entrepreneurship is making young people aware about the concept of entrepreneurship and inspiring them to become entrepreneurs. Hence, the concept of arthalaya was born. It is a five day residential workshop where participants learn about economics and entrepreneurship. The participants not only get involved in theoretical sessions and group works but also have to run their own business during the course of the workshop. This helps them translate their learnings into a firsthand experience of running a business. We recently concluded 16th batch of arthalaya and now have 384 (16*24) graduates. 3. As a columnist writing on economic and financial issues, how do you see the status of young entrepreneurs and entrepreneurship as a whole? It is inspiring to see more and more young people interested in entrepreneurship. It makes happy to see young people starting out new ventures in various fields, from agro-business to outsourcing. The importance of entrepreneurship is slowly being recognized. These entrepreneurs are going to be a vital force in bringing about the much needed progress and change, especially in economic frontiers, in the country. However, whether a nation generates significant amount of entrepreneurs in overall is largely determined by the environment it creates for its entrepreneurs.Strong and effective institutions that provide security to life and property, maintain rule of law, promote competition and innovation are needed for entrepreneurship development. Nepal lacks such institutions and our political economic process is , unfortunately is in reverse gear when it comes to creating entrepreneurial environment. However, we can be hopeful that the upcoming entrepreneurs will contribute significantly in creating and enhancing these institutions as well. 4. What are the crucial factors you see that needs to be worked upon to develop workshops like Arthalaya and organizations supporting such events have been doing? While developing programs like arthalaya it is very necessary that they are designed in a youth friendly way. By this, I mean the program should be very interactive and participative without missing the information and knowledge of the related topic. If such programs are run in the traditional way (one-way lecture), participants are likely to get bored and find little value in the program. Mixture of practical activities along with the theoretical stuff is necessary. For example, in arthalaya we have a dual approach of teaching the participants about entrepreneurship and economic policies. They go through different theoretical sessions like lectures, presentations and group work on the topic. On the other hand, they are asked to run their own businesses throughout the workshop period. This helps to reinforce their learnings during the theoretical sessions. Diversity of participants is another crucial factor that determines the vibrancy and effectiveness of the workshop. In the context of Nepal, rigorous selection process for participants is also very necessary. one of the tendency among our young people is to apply for any workshop (even if they have little interest in the subject matter) if it means getting another certificate. Without a rigorous selection process, you might end up with disinterested participants. 5. What would you suggest aspiring entrepreneurs as the three most required skills to begin their career as one? Based on my observations team building, networking and selling are among the three most important skills for aspiring entrepreneurs. 6. How effective do you think are such events or workshops to develop oneself as an entrepreneur? 7. Do you believe there is a formula and or pattern for becoming a successful entrepreneur? No. There isn't. If there was such a formula, many people could have become entrepreneurs. But there are common traits I have found among successful entrepreneurs. Some of them are persistence, extreme dedication to one's work/cause, excellent networking and focus on value creation for consumers.